Rep. Ilhan Omar (D-MN) used her “apology” for antisemitic rhetoric Monday to attack House Minority Leader Kevin McCarthy (R-CA) — barely an hour after she had issued a statement acknowledging her offensive remarks. 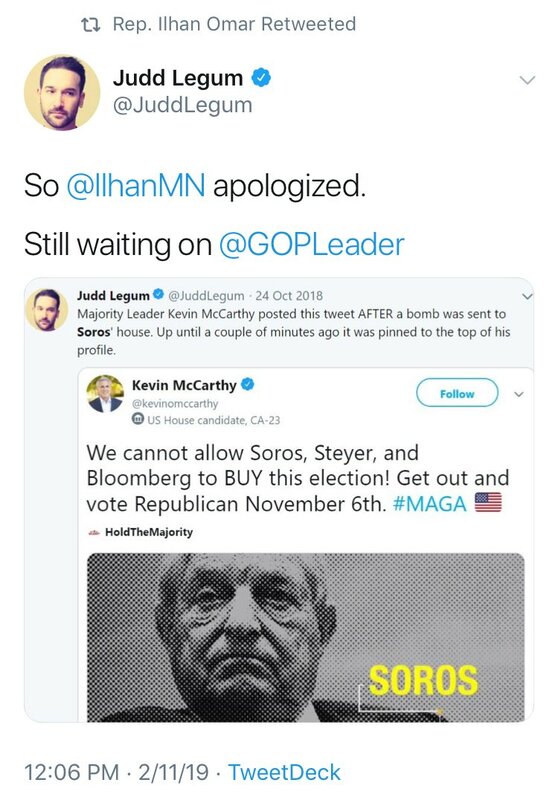 Omar, using her congressional account, then retweeted left-wing pundit Judd Legum, who attempted to create an equivalence between Omar’s antisemitic tweets, and a tweet by Rep. McCarthy’s last year accurately noting that George Soros, Tom Steyer, and Michael Bloomberg were major contributors to the Democratic Party in 2018. Bloomberg, the media mogul and former New York City mayor, was the top Democratic contributor of the 2018 cycle, spending $95 million. Steyer, a financier who is spearheading an campaign to urge Democrats to impeach President Donald Trump, was second, at $73 million. Soros, a long-time supporters of Democratic candidates and left-wing organizations, was fifth, at $19 million, according to campaign finance date compiled by OpenSecrets.org. McCarthy deleted his tweet, concerned that it might be misinterpreted in light of the mass murder at the Tree of Life synagogue in Pittsburgh. Omar’s tweets remain live — as does a 2012 tweet she has acknowledged is offensive. Speaker of the House Nancy Pelosi (D-CA), Senate Minority Leader Chuck Schumer (D-NY), and other party leaders denounced Omar’s rhetoric as antisemitic. However, Pelosi declined to remove Omar from her committee assignments — including the House Foreign Affairs Committee, where her views would play a role in determining U.S. policy toward Israel. McCarthy has promised to take action against antisemitism in the House later this week.